The Advantech Design SCATS 16 channel modem units are a single-gate CMOS FSK (Frequency Shift Keying) modulator conforming to Bell 103 300-baud data communication of a pair of telephone lines. Each 16-channel unit comes in a black-anodized 1-RU 19” rack-mount format. 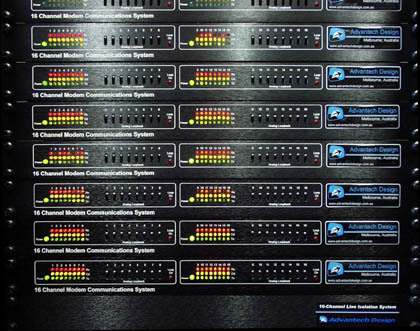 The units are designed to be stacked in a 19” rack-mount frame to allow up to 256 channels to be connected to a SCATS 6 regional computer System. The modems include a carrier detect circuit as part of the demodulator section, and a duplexer circuit for direct operation over a telephone line via a balanced 600-ohm line isolation unit. The modem design includes low-band and high-band pass filters and analog loop-back for self-testing. CMOS technology reduces power consumption to less than 4 watts per 16-channels. The use of SMT (Surface Mount Technology) reduces unit size, while providing increased reliability in a state-of-the-art technology format. The units operate from a mains voltage of 100 – 260VAC 50-60Hz, and incorporate a Mains Filter IEC connector and rear-mounted power switch. Designed in a 19″ rack mountable format (1RU), the units are stackable from 16 through to 256 channels providing capability for any SCATS 6 Regional Computer System. The units consist of 16 Silicon Gate CMOS low-speed modems conforming to the Bell 103 communications standard. Operating in Originate Mode, they are designed to interface between the SCATS Regional Computer RS-232 interfaces (e.g. Perle RRC-16 or Digi-con 16 channel RS-232 devices), and the Advantech Design 16-channel 600-ohm Line Isolation Unit before connection to the telecommunications network. The modem circuitry contains protection against damage due to high static voltages or electric fields. The Filter Bias Output Impedance is typically 16k ohm, providing an adjacent channel rejection of –48 dBm. Transmit data is input to the circuit, where it is converted to a FSK signal and routed through a low-band band pass filter. The filtered output signal is then buffered by the transmit op-amp line-driver, which then drives the output signal directly into the 600-ohm load from the Advantech Design Line Isolation Unit.